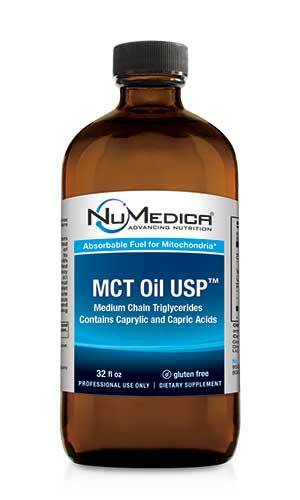 NuMedica MCT Oil may be an effective way to burn more calories and experience greater energy. MCTs, medium-chain triglycerides, are a special type of fatty acid that the body handles less like a fat and more like a carbohydrate. By treating this fat like a carb, the body is able to process it is more efficiently as energy, so it is less likely to be stored as fat. Moreover, eating a meal with MCT oil as a component (i.e. enjoying it as a salad dressing component) improves the body's metabolism so that even more calories are burned. If you are struggling to lose weight, NuMedica MCT Oil may be able to rev up your metabolism to more effectively burn calories. This healthy saturated fat, derived from coconut oil, is metabolized directly to the liver bypassing the normal digestion process like other fats. Naturally, a healthy diet of whole natural foods, hydration, stress management, and proper sleep are important for healthy weight loss, but this oil can be another powerful ally in your fight to lose weight or maintain your healthy weight. One of the ways that MCT oil boosts your metabolism is that it is quickly absorbed by the body as fuel. The body quickly and efficiently metabolizes this oil instead of storing it as fat as so many other foods are. During the metabolism process, other calories are also burned more efficiently. The result is that this oil revs up your metabolism process to provide you with the energy you need-and without the fat storage that you don't want! Although you should not fry with NuMedica MCT Oil because of its low boiling point, you can substitute it for conventional oils used in salad dressings or sauces. Plant-based MCT oil is essential odorless and flavorless, so it isn't going to affect the taste of your food. It is simply going to enhance your body's metabolism and provide you with the nutritional energy you need to thrive during your day. 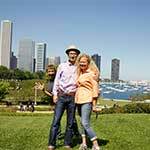 This oil may produce a mild laxative effect. NuMedica provides MCT Oil in three sizes: 8 oz, 16 oz, and 32 oz. Each bottle contains 16, 32, and 64 tablespoon servings respectively. Choose the size which works best for you! MCT Oil USP (Small) - 8 oz 1 Tablespoon 16 Take one tablespoon two to four times daily or as directed by your healthcare practitioner. MCT Oil USP (Medium) - 16 oz 1 Tablespoon 32 Take one tablespoon two to four times daily or as directed by your healthcare practitioner. MCT Oil USP (Large) - 32 oz 1 Tablespoon 64 Take one tablespoon two to four times daily or as directed by your healthcare practitioner. Ingredients: 100% USP (United States Pharmacopeia) Verified MCT Oil (from coconut oil). Contains: Tree nuts. Free of: Milk, eggs, fish, shellfish, peanuts, wheat, soy. 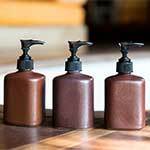 Lotion That Can Help You Lose Weight?!?! Let's buy it in bulk! Why have we never heard of this before? My bottle expired 2 weeks ago It's never been opened Is it safe to use still? Yes. NuMedica supplements are professional-grade which means they are manufactured with the highest-quality ingredients in a rigorous manufacturing process with high quality-control standards. 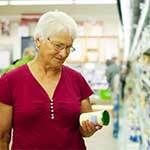 Therefore, the supplements generally exceed the specifications on the ingredients label. Has the lauric acid been stripped out of this product? No, it actually never contained it. Lauric acid is in straight coconut oil. 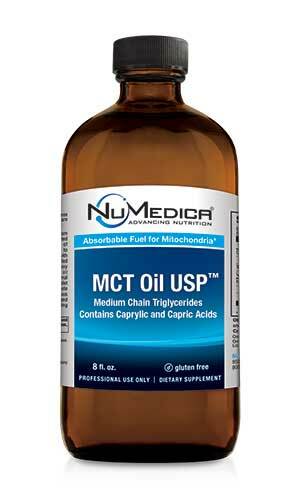 NuMedica MCT Oil is better in that it has the C8 and C10 medium chain triglycerides. Even though lauric acid is sometimes referred to as a medium chain, it is really a long chain fatty acid and therefore doesn’t have the benefit that MCT oil has as a fatty acid which is more fully metabolized for energy in the body. What % is C8 and what % is C10? Medium Chain Triglyceride (MCT) Oil is produced by steam distilling raw coconut and palm oil. The process is completely solvent free. At certain temperatures and pressures the fatty acids C8 and C10 are efficiently and gently removed from the raw oil. The finished oil is very close to 100% C8 and C10 fatty acids and is comprised of roughly 60% C8 and 40% C10.